Sprayzer is a unreleased Super Assault Bakugan. It looks similar to Razoid. Sprayzer is the second Super Assualt Bakugan to have pegs for Battle Gear compatibility. In the newest Gundalian Invaders commercial they showed a Darkus Sprayzer. 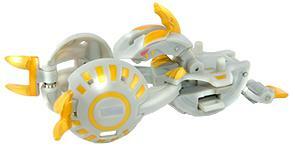 Purchase your Sprayzer Bakugan from Amazon now!